Y’all know about our Sunday morning Pancake Breakfast tradition, right?! I think I’ve mentioned it before. It started when Steve and I were first married. We made pancakes for breakfast most Sunday mornings. And then after a year or so, it became every Sunday morning. It was mostly a Steve thing. He is the pancake master. He knows just the right temperature of the griddle. He knows just when to flip them so they are just the right color. And he knows just when to take them off. I, on the other hand, know little about the flipping process. And a lot about the batter making process. I have been experimenting with homemade pancake batters for years now. And I like to think I’ve got it down to a science at this point. We make a great team come Sunday mornings…and we have a new edition to our pancake making team. Charlie is 3 and a half. And he is my little sous chef. He’s always asking to help in the kitchen. He wants to get the ingredients out. He wants to crack the eggs. (Which I let him do the first egg…and it usually turns into a mess, but I’m OK with that.) He likes to add the ingredients cup by cup. And he loves to stir. **Please note that I did use Almond Milk in this recipe. Most other recipes I make with both a dairy-free milk and regular milk…but I haven’t had a chance to try this one with regular milk. I would imagine it doesn’t need much altering…if anything it would be about 1/4 cup less regular milk than the Almond Milk that’s used in the recipe. This pancake recipe is just to get you excited about all the other great pancake recipes coming in the $5 Dinner Mom Breakfast and Lunch Cookbook!!! Perfectly fluffy. With the perfect burst of raspberry flavor. And a lovely little crunch from the almonds. A delightful Sunday morning breakfast. Add the oil, milk, egg and vanilla to a large mixing bowl. Mix lightly with a whisk or fork. Add the flour, sugar, baking powder and salt to the bowl. 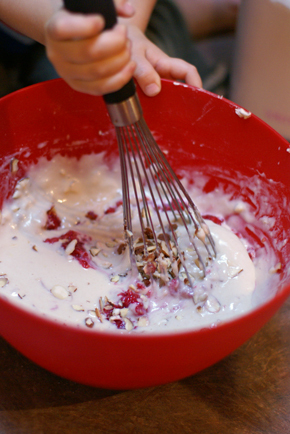 Whisk the batter until smooth. Run a knife through the sliced (slivered will work too) almonds. Gently press a fork over the raspberries, crushing them lightly. 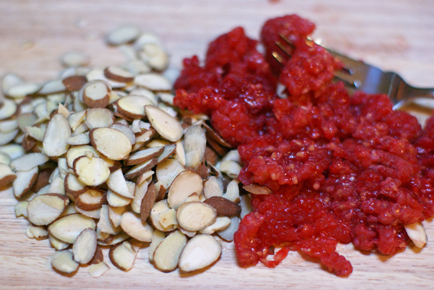 Fold the chopped almonds and the crushed raspberries into the batter. Cook the pancakes on a griddle of some sort, using up all the batter. Serve Almond Raspberry Pancakes with Fruit, Scrambled Eggs, Breakfast Sausage, Bacon…whatever your little breakfast heart’s desire.